Complete the forms, and start creating your PT schemes. You can save your drafts for later use or submit the factsheets if you feel they are ready for publishing. You remain the owner and once published, you have the freedom to edit and re-submit your entries whenever you want. Our coordinators will review your submissions and approve (or reject) them for publication. Need more info? We describe the procedure in more detail in this manual. Please let us know if you have any questions. 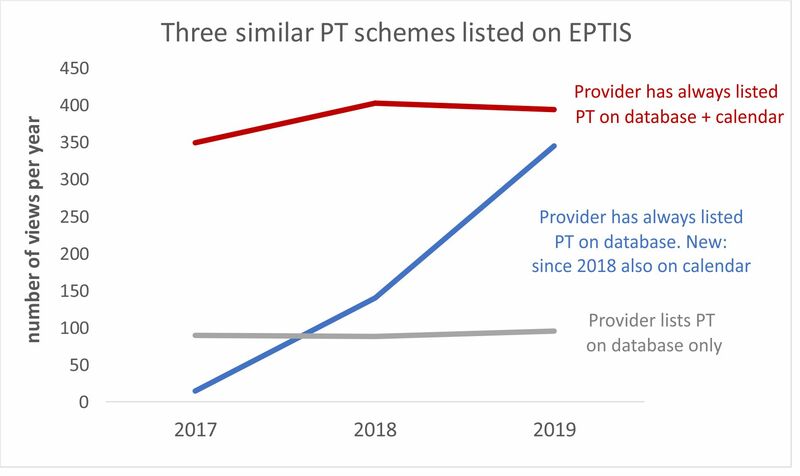 The EPTIS PT round calendar complements the PT scheme database perfectly by showing which PT rounds are coming up next. The calendar is open for announcements from all PT providers worldwide. We think the calendar is a great service, both for laboratories and PT providers. Especially if you are looking for additional participants for a new or small PT round, the calendar helps by bringing it to the attention of the international lab community. Our web statistics seem to confirm its effectiveness - see the graph on the left. It shows the number of pageviews for three different PT scheme factsheets that are listed on the database. Those factsheets are linked to from the calendar, and counting the number of factsheet pageviews gives us an indication of the impact of the relating PT round listing on the calendar (after checking the validity of this reasoning by further analysis). The 'red PT' has always had a listing on the calender whereas the 'grey PT' was never listed on it. The 'blue PT' leaps a factor 10 in pageviews in 2018 and this is likely due to advertising the PT on the calendar for the first time then. This assumption is backed by further analysis, showing that its pageviews peaked during the days and weeks the calendar entry was online. The fee for inclusion of one PT round in the calendar is 80 euro net. The format is a few keywords on matrix and parameters plus two links to a flyer, your website, or the corresponding entry in the EPTIS database. The earlier you announce your PT round, the longer it remains on the list and the better its visibility. Once your registration date is approaching, we will highlight your round on the EPTIS front page. Please contact us for further info at eptis[at]bam.de. We have just (as of January 2019) started the EPTIS event calendar as an additional service. It covers more than the PT sector alone because we think our visitors are also interested in closely related topics. Moreover, it is our aim to start offering CRM info on our website as well in future - so this is already a first step towards having this broader scope. Should you share our interest in the event calendar and wish to advertise your events here, let us know. The cost is the same as for the PT round calendar - see above.